This episode of Inside Out originally aired in the fall of 2001. Louisa Lombard interviews her cousin, a top prospect for the Atlanta Braves, about the chutes and ladders of the minor leagues. Rachel Katzman investigates the Slaterettes – the country’s only all-girl little league. 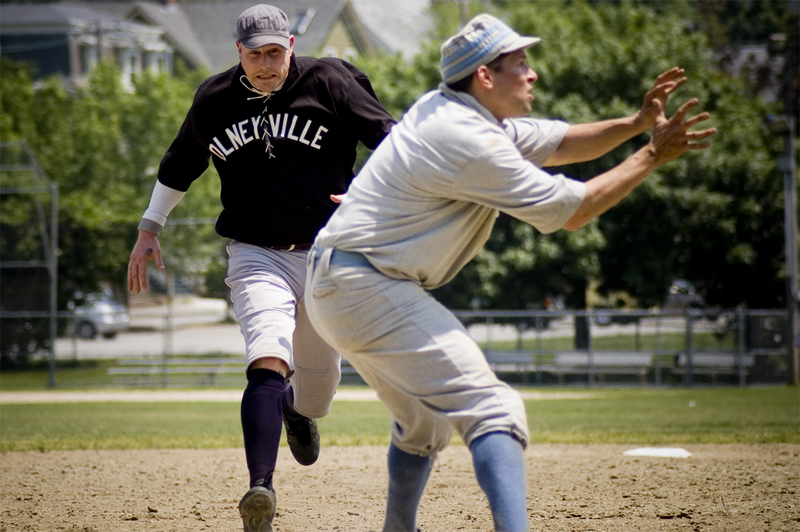 Samm Tyroller-Cooper asks why members of the Providence Grays (pictured above) want to play baseball like it’s 1879. Hosted by Molly Messick with Executive Producer Robin Amer. Contributors include Megan Hall, Selena Juneau-Vogel, Doug Fretty, Rachel Terp, Matt Puntigam, and Gabriel Wildau. Oversight by Beth Taylor.